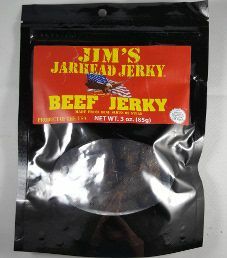 The first review for Jim’s Jarhead Jerky will focus on a 3 ounce/85 gram bag of their Teriyaki flavored beef jerky. This flavor is described as being Jim’s signature flavor. The jerky bag was kindly submitted for review by the owner, Jim Ewen.